Straw color. Aromas of lemon zest, chervil, orange blossom, and honey with a satiny, vibrant, dry-yet-fruity light body and a smooth, refreshing, medium-length acacia and fresh pear finish with no oak flavor. A rich and layered pinot grigio with charming white floral notes and vibrant acidity. Bottom Line: A sophisticated pinot grigio with charming white floral notes and vibrant acidity; rich and layered. 84 • 90 Novantaceppi 2016 Appassimento, Puglia IGP 14.5% (Italy) $12.99. 90 • Acquesi NV Asti Spumante 7% (Italy) $19.99. 93 • Acquesi NV Brachetto Piemonte 6.5% (Italy) $19.99. 89 • Acquesi NV Cortese, Piemonte DOC 11% (Italy) $19.99. 86 • Acquesi NV Rosato Brut Rosé, Piemonte DOC 11% (Italy) $19.99. 90 • Acquesi NV Secco, Asti 11% (Italy) $14.99. 88 • Art of Earth 2015 Organic, Pinot Grigio, Terre Siciliane IGP 12% (Italy) $9.99. 91 • Art of Earth NV Frizzante, Prosecco DOC 10.5% (Italy) $.00. 85 • Art of Earth 2014 Montepulciano d’Abruzzo DOC 12% (Italy) $9.99. 93 • Art of Earth 2016 Pinot Grigio, Terre Siciliane IGP 12.5% (Italy) $9.99. 89 • Art of Earth 2016 Qualitätswein, Riesling, Rheinhessen 12.5% (Germany) $12.99. 88 • Art of Earth 2015 Montepulciano d’Abruzzo DOC 13.5% (Italy) $9.99. 87 • Art of Earth 2016 Pinot Grigio, Terra Siciliane IGT 12.5% (Italy) $9.99. 88 • Art of Earth 2016 Montepulciano d’Abruzzo DOC 13% (Italy) $9.99. 87 • Art of Earth 2017 Pinot Grigio, Terre Siciliane IGT 12% (Italy) $9.99. 85 • Art of Earth 2017 Montepulciano d’Abruzzo DOC 13.5% (Italy) $9.99. 89 • Asio Otus NV Bianco, Italy 12.5% (Italy) $14.99. 88 • Asio Otus NV Rosso, Italy 13% (Italy) $14.99. 90 • Barone Montalto 2014 Terra Siciliane IGT 14% (Italy) $9.99. 92 • Barone Montalto 2014 Nero d’Avola-Cabernet Sauvignon, Terra Siciliane IGT 13.5% (Italy) $9.99. 89 • Barone Montalto 2016 Pinot Grigio, Terra Siciliane IGT 12% (Italy) $14.99. 89 • Barone Montalto 2016 Cabernet Sauvignon-Nero d’Avola, Terra Siciliane IGT 13.5% (Italy) $14.99. 89 • Barone Montalto 2017 Rosso Passivento, Terra Siciliane IGT 14% (Italy) $14.99. 93 • Barone Montalto 2017 Pinot Grigio, Terra Siciliane IGT 12% (Italy) $9.99. 93 • Barone Montalto 2017 Nero d’Avola-Cabernet Sauvignon, Sicilia DOC 13.5% (Italy) $9.99. 90 • Bianco Nobile NV alla Vaniglia, Germany 10% (Germany) $9.99. 88 • Cardigan Bay 2016 Sauvignon Blanc, Marlborough 12.5% (New Zealand) $14.99. 91 • Cardigan Bay 2016 Sauvignon Blanc, Marlborough 12.5% (New Zealand) $14.99. 89 • Castellani 2011 Chianti Classico Riserva 13% (Italy) $14.99. 85 • Castellani 2015 Chianti Colli Senesi 12.5% (Italy) $9.99. 83 • Cava del Forte NV Semi Seco, Cava DO 11.5% (Spain) $8.99. 90 • Cava dell’Ara NV Semi Seco, Cava DO 11.5% (Spain) $8.99. 86 • Cuvee N. 5 Brut NV Brut Cuvee Sparkling Wine, France 11% (France) $2.00. 83 • Dellara NV Brut, Cava DO 11.5% (Spain) $5.99. 91 • El Guardian 2011 Reserva, Rioja DOC 12.5% (Spain) $19.99. 87 • El Guardian 2014 Crianza, Rioja DOC 12.5% (Spain) $14.99. 90 • El Tractor 2015 Malbec, Mendoza 14% (Argentina) $12.99. 86 • El Tractor 2017 Malbec, Mendoza 13% (Argentina) $12.99. 89 • El Tractor 2018 Malbec, Mendoza 13% (Argentina) $10.99. 89 • Essenza di Vita 2015 Pinot Grigio, Delle Venezie IGT 12% (Italy) $7.99. 86 • Essenza di Vita 2016 Pinot Grigio, Delle Venezie IGT 12% (Italy) $7.99. 89 • Essenza di Vita 2017 Pinot Grigio, Delle Venezie DOC 12% (Italy) $7.99. 83 • Exquisite Collection 2016 Malbec, Mendoza 13% (Argentina) $7.99. 87 • Exquisite Collection 2016 Malbec, Mendoza 13% (Argentina) $7.99. 90 • Exquisite Collection 2016 Sauvignon Blanc, Marlborough 12.5% (New Zealand) $9.99. 89 • Exquisite Collection 2017 Sauvignon Blanc, Marlborough 12.5% (New Zealand) $9.99. 91 • Exquisite Collection 2018 Single Vineyard, Sauvignon Blanc, Marlborough 12.5% (New Zealand) $9.99. 93 • Exquisite Collection 2018 Malbec, Mendoza 13% (Argentina) $7.99. 89 • Famiglia Castellani 2011 Chianti Classico Riserva 13% (Italy) $19.99. 91 • Famiglia Castellani 2015 Annata, Chianti Colli Senesi 12.5% (Italy) $14.99. 87 • Famiglia Castellani 2015 Toscana Rosso 12.5% (Italy) $14.99. 91 • Famiglia Castellani 2015 Vermentino, Toscana IGT 12% (Italy) $14.99. 92 • Famiglia Castellani 2011 Brunello di Montalcino 14% (Italy) $69.99. 92 • Famiglia Castellani 2012 Chianti Classico Riserva 13% (Italy) $19.99. 89 • Famiglia Castellani 2016 Vermentino, Toscana IGT 12% (Italy) $14.99. 90 • Famiglia Castellani 2012 Brunello di Montalcino 14% (Italy) $59.99. 86 • Fleur de Rosee 2016 Rose, Côtes de Provence 12.5% (France) $14.99. 82 • Fleur de Rosée 2017 Rosé, Côtes de Provence 12.5% (France) $14.99. 89 • Fontaine de Chocolat NV Germany 14% (Germany) $9.99. 92 • Giacondi 2016 Pinot Grigio, Delle Venezie IGT 12% (Italy) $8.99. 88 • Giacondi NV Prosecco DOC 11% (Italy) $14.99. 88 • Holly Hill Farms NV Egg Nogg, Germany 13.9% (Germany) $6.99. 90 • Idyll 2015 Oak Aged, Shiraz, Barossa Valley 14% (Australia) $9.99. 83 • La Rue 2017 Rosé, Côtes de Provence 12% (France) $8.99. 85 • La Rue 2018 Rosé, Côtes de Provence 12% (France) $8.99. 87 • Laessiger 2017 Gruner Veltliner, Niederösterreich 12.5% (Austria) $9.99. 84 • L’Amore di Giulietta 2016 Vino Bianco, Chardonnay, Italy 12.5% (Italy) $9.99. 87 • L’Amore di Giulietta 2016 Vino Rosso, Cabernet Sauvignon, Italy 13% (Italy) $9.99. 88 • Laurendeaux Cognac VS 40% (France) $29.99. 94 • Louis Revoir NV Brut Cuvee Prestige, Champagne 12% (France) $29.99. 92 • Louis Revoir NV Cuvee Prestige Brut, Champagne 12% (France) $19.99. 89 • Luna Argenta 2016 Appassite, Negroamaro-Primitivo, Puglia IGT 14% (Italy) $14.99. 86 • Mosketto NV Pink Frizzante Sparkling Dessert Wine, Italy 5% (Italy) $9.99. 84 • Mosketto NV Red Frizzante Sparkling Dessert Wine, Italy 5% (Italy) $9.99. 88 • Mosketto NV White Frizzante Sparkling Dessert Wine, Piedmont 5% (Italy) $9.99. 90 • Nero Nobile NV all’Espresso, Germany 10% (Germany) $9.99. 88 • Petit Chocolat NV Dark Chocolate and Cream Red Wine Specialty , Germany 14% (Germany) $8.99. 82 • Petite Raspberry NV Raspberry and Cream White Wine Specialty , Germany 14% (Germany) $8.99. 88 • Pico Andico 2016 Special Selection, Malbec, Mendoza 13% (Argentina) $14.99. 88 • Pico Andico 2016 Special Selection, Malbec, Mendoza 13% (Argentina) $9.99. 93 • Primanatura NV Prosecco DOC 10.5% (Italy) $7.99. 87 • Rasgon 2016 Macabeo, Tierra de Castilla 11.5% (Spain) $8.99. 87 • Rasgon 2016 Tempranillo, Tierra de Castilla 13% (Spain) $8.99. 87 • Retief 2016 Reserve Cape Red Blend, South Africa 14% (South Africa) $19.99. 90 • Riva Leone 2015 Gavi DOCG 12% (Italy) $14.99. 92 • Riva Leone 2015 Gavi 12% (Italy) $14.99. 86 • Riva Leone 2016 Barbera, Piemonte DOC 13% (Italy) $9.99. 89 • Riva Leone 2013 Barolo DOCG 14% (Italy) $34.99. 89 • Riva Leone 2014 Barbaresco DOCG 13.5% (Italy) $24.99. 84 • Riva Leone 2016 Gavi DOCG 12% (Italy) $14.99. 90 • Rosso Nobile NV al Cioccolata, Germany 10% (Germany) $9.99. 85 • Santodeno 2016 Sangiovese Appassimento, Romagna DOC 14% (Italy) $14.99. 84 • Seratina 2015 Pinot Grigio, Delle Venezie IGP 12% (Italy) $9.99. 89 • Single Vineyard 2017 Rosé, Languedoc AOP 12.5% (France) $10.99. 89 • Single Vineyard 2017 Merlot, Pays d’Oc IGP 13.5% (France) $10.99. 89 • Soledoro NV Vino Spumante Brut, Prosecco DOC 11% (Italy) $14.99. 92 • Stella Cadente 2015 Falanghina del Sannio DOC 13.5% (Italy) $19.99. 92 • Veuve Monsigny NV Brut, Champagne 12% (France) $19.99. 85 • Veuve Monsigny NV Brut Rosé Champagne 12% (France) $19.99. 93 • Waikiwi Bay 2016 Sauvignon Blanc, Marlborough 12.5% (New Zealand) $6.96. 90 • Waikiwi Bay 2016 Sauvignon Blanc, Marlborough 12.5% (New Zealand) $6.96. 88 • Waikiwi Bay 2017 Sauvignon Blanc, Marlborough 12.5% (New Zealand) $6.96. 89 • Zironda 2013 Ripasso, Valpolicella DOC 13.5% (Italy) $19.99. 91 • Zironda 2012 Amarone della Valpolicella DOCG 15% (Italy) $39.99. 81 • Zironda 2013 Ripasso della Valpolicella DOC 13.5% (Italy) $19.99. 89 • Zironda 2013 Amarone della Valpolicella DOCG 15% (Italy) $39.99. 88 • Zironda 2014 Ripasso della Valpolicella DOC 13.5% (Italy) $19.99. 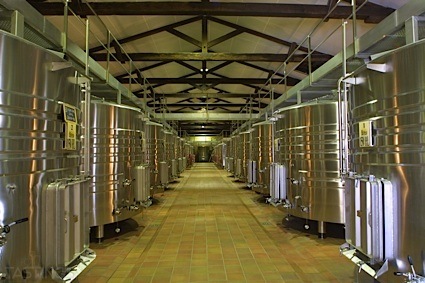 Pinot Grigio – aka Pinot Gris – has become one of Italy’s most popular white wines in America. Popular to the point of Indian, Greek and even Spanish restaurants offering at least one version on their wine list. Truth be told, while Pinot Grigio in Italy can be an excellent wine – though hardly great – the typical version has little to offer save for some faint aromas of apple, pear and dried flowers. As Pinot Grigio has become a commodity, there are now hundreds, perhaps thousands of producers across Italy (and even some in America) that produce a simple, uncomplicated version that has little complexity or weight on the palate- the ultimate summer sipper. However, producers in cool climates such as Friuli, Alto Adige and Valle d’Aosta (where it is usually referred to as Pinot Gris) do make excellent version, generally from high elevation vineyards that have twenty or more years of age. These wines have plenty of spice as well as richness and offer impressive complexity. Pair these finer examples with vegetable or seafood risotto, lighter poultry or pork medallions. 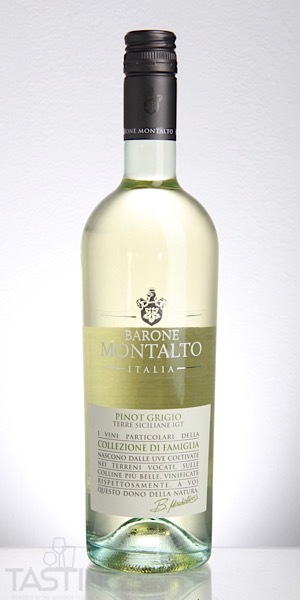 Barone Montalto 2017 Pinot Grigio, Terra Siciliane IGT rating was calculated by tastings.com to be 93 points out of 100 on 12/4/2018. Please note that MSRP may have changed since the date of our review.